Project obstacles and solutions: St. Thomas Hospital was adding onto their oncology radiology center. The hospital was installing a new radiotherapy and radiosurgery system that required very tight specs on the concrete walls directly impacted by the radiation emitted during treatment. There are two issues of concern in concrete used in such an application. First, the density of the wall has to be such that it would deflect radioactive matter rather than absorbing or letting it to pass through. The second concern is thermal cracking due to intense heat. The walls had to be constructed of heavyweight concrete. Typically, steel shot is used in heavyweight concrete, but this would not have the radio-deflection needed. IMI engineered a mix of heavy, dense, natural aggregates and lab tested samples with the project physicist. The concrete was tested for unit weight, compressive strength and calorimetrics to establish heat curves. Beyond these technical specs, there was the issue of placement. The radiation room was small and heavyweight concrete is batched to weigh 5 tons per yard. Charter Construction used a modified bucket with a forklift to move the concrete from the mixer to the wall forms. IMI mixed and moved the concrete onto the job site in short loads to ensure the concrete would not be compromised during the unloading process. Each truck took 90 minutes to unload. IMI monitored the slump as each truck was unloading. 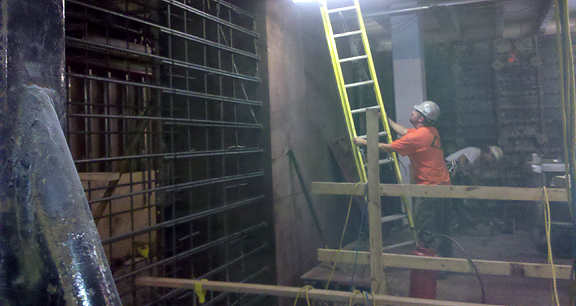 In two days, IMI supplied 50 yards of heavyweight concrete to the St. Thomas Hospital project.